Beautiful character gite with 'en pierre' walls, provençal painting, old beams and wooden floor.This gite has fantastic views to the Pyrenees and into the valley. It has an open-plan living/ dining/ kitchen area, complete with dishwasher, washing machine, microwave, cooker with oven, fridge with freezer compartment, toaster, TV, DVD, radio/ CD player etc. There are 2 bedrooms; one with a good-sized double bed and one with two single beds. Modern bathroom. Private grassy area in front of the gite with seats and table for al fresco dining. On the side there is another outside seating to enjoy the fantastic views. Our Domaine is a meticulously restored 16th Century property with fantastic pool near Carcassonne and Fanjeaux on the top of the hill with the most amazing views in all directions in a very quiet setting yet close to all amenities. The large pool offers great swimming and superb views into the valley. The historic atmosphere and idyllic setting of the farmhouse will seduce you. You taste the tranquility of the rural French life. The gites are self catering cottages which offer the comfort and privacy you are searching for to get away from your stressed life and enjoy a relaxing holiday in an area steeped in history and culture. This charming and authentic property has 5 comfortable quality gites that are restored in keeping with the traditional style of the farmhouse. Our gites have names that are linked to the direct environment e.g. La Vigne is fully covered by a vigne vierge, from Le Sanglier you may have the chance to see wild boars early in the morning and Le Hibou has always barn-owls “next-door” under the attic. There is a private parking on the property. Beautiful traditional French farmhouse, divided into well equipped cottages. Lovely scenery, gardens and swimming pool overlook surrounding countryside. 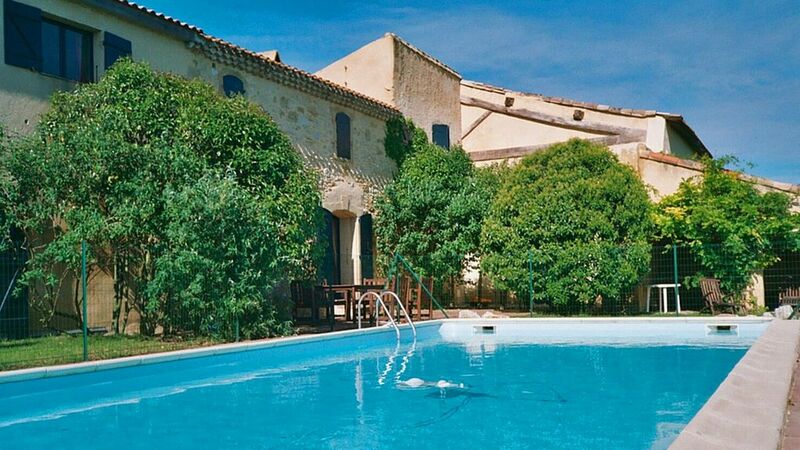 Good location easy access to the Mountains, Mediterranean, Carcassonne and Toulouse. Host very friendly with good local knowledge. A great family getaway. Thanks for your review; we also enjoyed your stay here with us. We stayed for some days in the Languedoc on Domaine La Grangette; a very nice cottage, good positioned. Impressive property a few hundreds years old. The owners are really good hosts and give you a secure feeling from the first moment on. They have guided us for a few days to nice markets (Mirepoix and Revel) and good local restaurants. Thanks for all your help. A great holiday for lazy people like us: no noise, no traffic, fantastic views and very private. We did make some visists to nearby wine-domains, restaurants and markets like Mirepoix and Bram. Very pretty gite with outstanding views. All of them have really private terraces in front and are not on a row like we had last year. If you like wine, dine and rest this is the place to be; we’ll be back next year with our friends. We have booked Le Hibou for one week and enjoyed it a lot. Perfect location for cyclists like us on the small twisty roads with fabulous views. The domaine is also not far away from the Canal du Midi to walk or cycle along in the shade. We particular liked our visit to Mirepoix with the pretty market on Monday. Gite was very tidy and tastefully decorated; friendly owners. Very quiet setting but still only a few minutes from the access to the motorway. Certainly recommendable for an active holiday. Nous avions décidé cette année de visiter la région des châteaux cathares. Le domaine est parfaitement situé par rapport aux châteaux. Malgré un temps mitigé, nous avons apprécié la visite de la plupart d'entre eux et nous avons satisfait en même temps notre seconde passion : les vignobles. Certains vignobles étaient un peu difficiles à trouver, mais quel régal ! On a trouvé de bons vins à un prix abordable pour stocker dans notre cave. L'hébergement était irréprochable, rien à redire. Het huis is gezellig, sfeervol en comfortabel ingericht, gelegen in een prachtige omgeving waar in we heerlijk hebben gewandeld en gefietst. Er zijn vele leuke uitstapjes mogelijk in de vorm van kleine dorpjes en oude kastelen. Ook zijn er veel leuke marktjes. Dit huisje is zeker een aanrader! La Grangette is situated near Fanjeaux ( where the Romans had a temple to Jupiter), the medieval fortified Carcassonne, the Cathar castles of Queribus, Peyrepertusis and Montsegur. The lovely medieval village Mirepoix is closeby and has a market every week. Markets can also be found in Revel and Limoux. The Canal du Midi is a world heritage site where boats can be rented or walks can be had along the shaded banks of the canal. It is a perfect place for a picnic. Around La Grangette there are walks that are also suitable for mountain bikes. For those who like mountain-hiking, the Pyrenees are at less then one hours drive. Famous wine regions like the Minervois, the Corbieres, the Cabardes, Limoux (sparkling white wine) and Fitou are nearby. The Mediterranean beaches are at one hours drive (Narbonne-plage). Gruissan, close to Narbonne, has a very chic marina where you can just stroll and dream before enjoying wonderful fresh seafood in one of the harbour-side restaurants. Furthermore there is the Lac de la Ganguise (sailing), Toulouse (city of the squares), Albi (birthplace of Toulouse Lautrec), Collioure (painters-village), Montolieu (village of the books), Andorre etc. Plenty of activities can be found nearby including golf, horse-riding, tennis, canoeing, wild-water rafting etc. Prijzen inclusief toeristenbelasting, water en electriciteit en beddegoed, eindschoonmaak à 60€, handdoeken 20€ per huis. Borg 200€. Prices include tourist tax, electricity and water and bed linen, cleaning fees of 60€, towels 20€ per cottage. Security deposit 200€. Preise: Touristensteuer, Elektrizität, Wasser und Bettwasche einbegriffen. Endreinigung von 60€, Handtücher 20€ pro Wohnung. Kaution 200€. Prix: Incl. tax de séjour, eau, électricité et linge de lit, ménage fin de séjour 60€, serviettes 20€/maison. Caution 200€.